All the parties, social gatherings and festive meals between Thanksgiving and New Year’s invite us to indulge in sweets and other treats and to enjoy the season. Often by January, though, our bodies are yearning for a cleanup and a return to a regular, healthy routine. What if there were a stressless and easy way to do this? 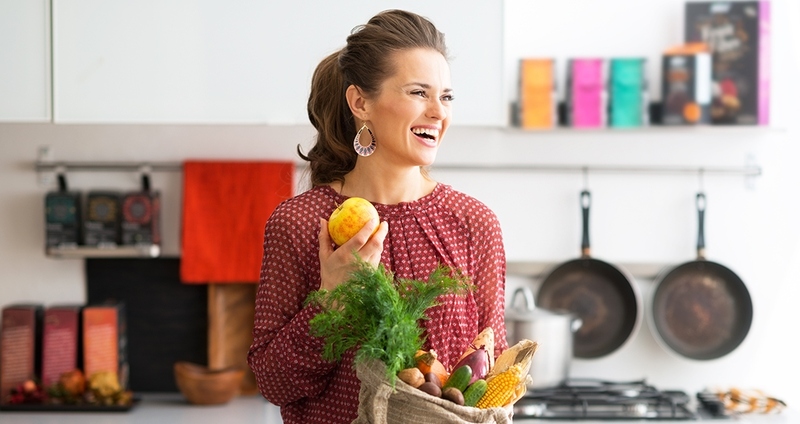 As a registered dietitian, I designed this detox as a gentle and effective way to reset your system by fueling your body with clean, simple, nutrient-dense foods that it knows how to digest and absorb efficiently. You won’t find any intense detox protocols in this 3-day plan, such as starvation or intense botanicals, which can often do more harm than good. 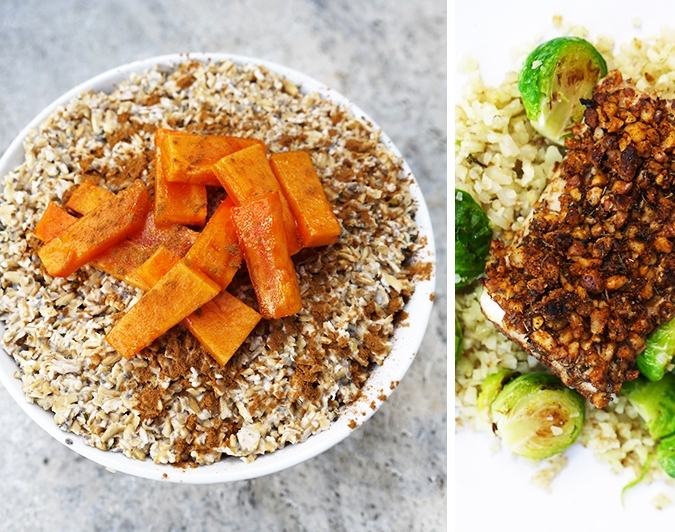 These recipes are easy to prepare, with real-food ingredients—creating less stress on you. After three days, you will feel refreshed, energized and ready to take on 2017 as the best version of yourself. 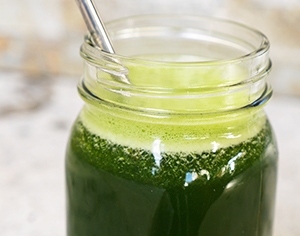 Day 1 of the detox is all about getting lots of greens back into your diet. When it comes to veggies, leafy greens like kale, spinach and romaine are known for their antioxidants and nutrient density. They are also rich in fiber, which aids the detoxification process by binding excess toxins so that they can be eliminated. Choose prewashed and prepared veggies to save time chopping in the kitchen. Salmon is an amazing source of complete protein and nutrients that benefit our skin, heart and brain, including omega-3 fatty acids, vitamin B12 and vitamin D.
Dinner: Baked salmon and asparagus: Coat both with lemon juice and olive oil, season with pink Himalayan salt and bake for 15–20 minutes at 400° F.
TIP: Make most meals ahead of time over the weekend to reduce stress during a busy week. Studies show that this is associated with eating out less and overall healthier diet choices throughout the day. 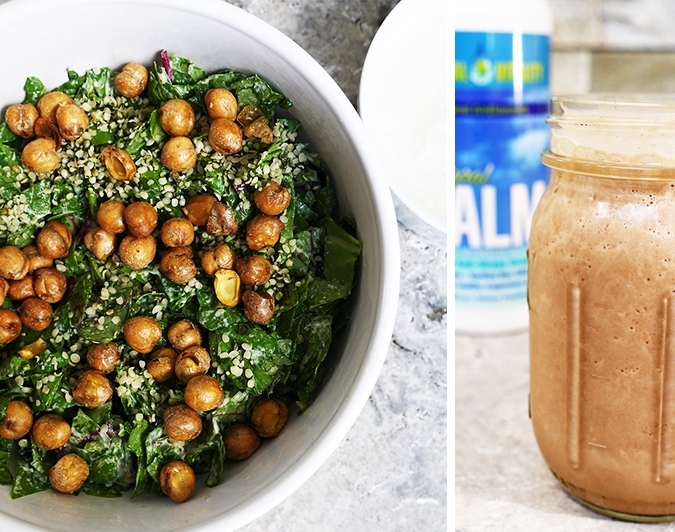 TIP: Getting a daily dose of magnesium can play a significant role in your detoxification processes, preventing possible damage to your body and brain from environmental toxins and heavy metals. Even your body’s “master antioxidant,” glutathione, requires magnesium for its synthesis. Day 2 is about protein and healthy fats in meals, to help balance blood sugars and keep energy and mood levels stable. Eggs, chicken and lentils are all excellent protein options that will keep you full until your next meal. Your lunch selection today is great for busy individuals with little time to cook. While cooking meals from scratch is ideal for controlling the ingredients used and portioning, there are in fact store-bought options available that are detox friendly. When purchasing ready-made foods, be sure to pay close attention to all ingredients and sodium content. TIP: Getting enough fluids is necessary to flush out excess sodium, sugar and alcohol consumed over the holidays. Start your day with an 8-ounce, room-temperature glass of water to wake up and detoxify your system. Be sure to continue drinking throughout the day, aiming for 2–3 liters. Choose water, herbal tea and Natural Calm to maintain energy levels, calm your nervous system and flush out toxins. On day 3, choose your carbohydrates wisely. Keep sugar and simple starches to a minimum for better blood-sugar control and more stable mood. Whole grains in this morning’s breakfast and afternoon snack boast fiber and B vitamins, which will help with energy levels and metabolism. Low-sugar fruit is also an excellent option when it comes to carbohydrates, since they are packed with nutrients, antioxidants and fiber—perfect fuel before some light exercise. TIP: Commit to rest every day while detoxing, and cut back on your to-do list. Eight hours of sleep is essential for your well-being, as it heals and regenerates new cells. In the evening, take a Natural Calm bath. 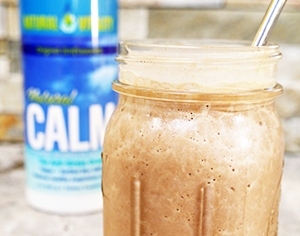 This is an amazing detoxifier and is calming for your nervous system. Heat a small skillet over medium heat. Add cooked chickpeas to the skillet with oil and pink Himalayan salt. Heat until slightly browned. In a small bowl, prepare dressing by combining tahini, lemon juice, water and a dash of pink Himalayan salt, if desired. 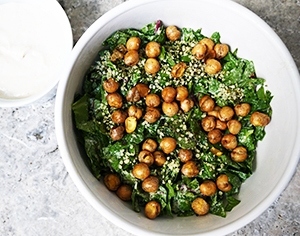 In a large bowl, toss leafy greens with toasted chickpeas and hemp seeds. Pour dressing over salad and massage with your hands. Serve immediately or store in an airtight container for 1–2 days. Top smoothie with extra cinnamon before serving. Slice lemon and apple into 1-inch pieces. 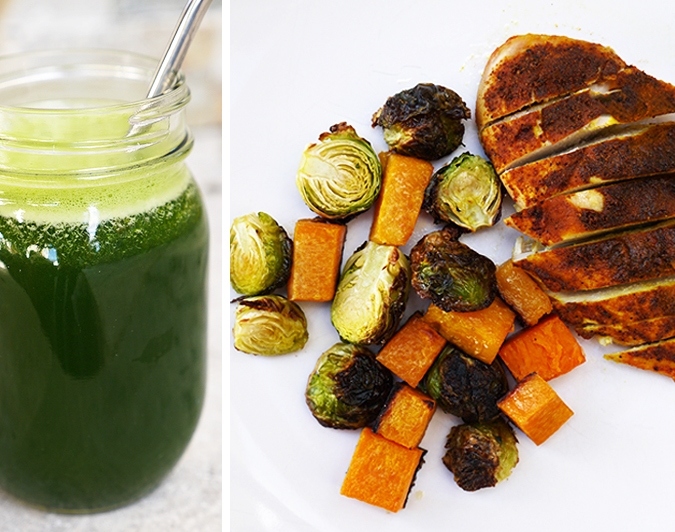 Slowly add all ingredients to your juicer or blender. Enjoy your juice immediately or store in an airtight jar for up to one day. Place chicken breast on an 8" x 8" lined baking dish. 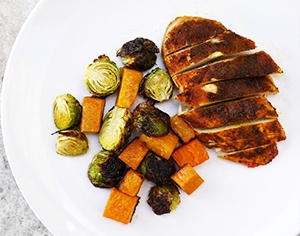 In a medium bowl, mix turmeric, garlic and paprika with lemon juice and one tablespoon avocado oil. Rub spice paste over chicken. In a medium bowl, toss veggies in one tablespoon avocado oil and pink Himalayan salt. Place veggies in another lined baking dish. Bake both pans in the oven for 20–25 minutes. 1 persimmon, sliced. Peeled and sliced apple also works. Add oats and almond milk to a pot and bring to boil. Reduce heat to low. 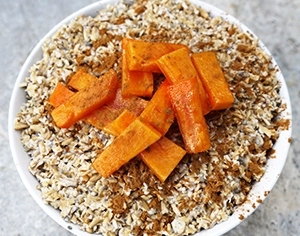 Stir in chia seeds, hemp seeds and cinnamon until fully incorporated and cooked. Remove from the stovetop and transfer to a small bowl. Add walnuts, paprika and thyme to a food processor and process until you get a coarse crumbly mixture. Transfer walnut spice mixture to a large plate. Coat mahi-mahi filet in the egg mixture and then the walnut spice mixture. Warm one tablespoon ghee in a skillet over medium-high heat. Add mahi-mahi fillet to the hot skillet and cook for 3 minutes on both sides. Place skillet in the oven for 5–7 minutes. 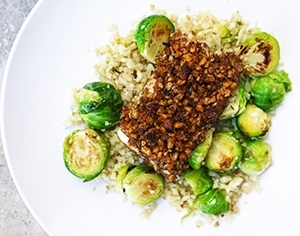 While mahi-mahi is baking, sauté Brussels sprouts and cauliflower rice in a medium pan with one tablespoon ghee over medium heat for 5 minutes. Serve mahi-mahi on top of vegetable mixture.